I can’t believe Christmas is just a few days away! I feel like we were just sitting down for Thanksgiving dinner last week. Now that all of my Christmas shopping is completed its time to get to our Christmas stockings! I’ve finally got everything ready and decided to give you all a sneak peek into what is hiding inside for our kids. I’ve also included the links for all the gifts in case you see something you just have to have! My little guy is still at an age where he doesn’t require much but he is growing fast and soon that will all change! 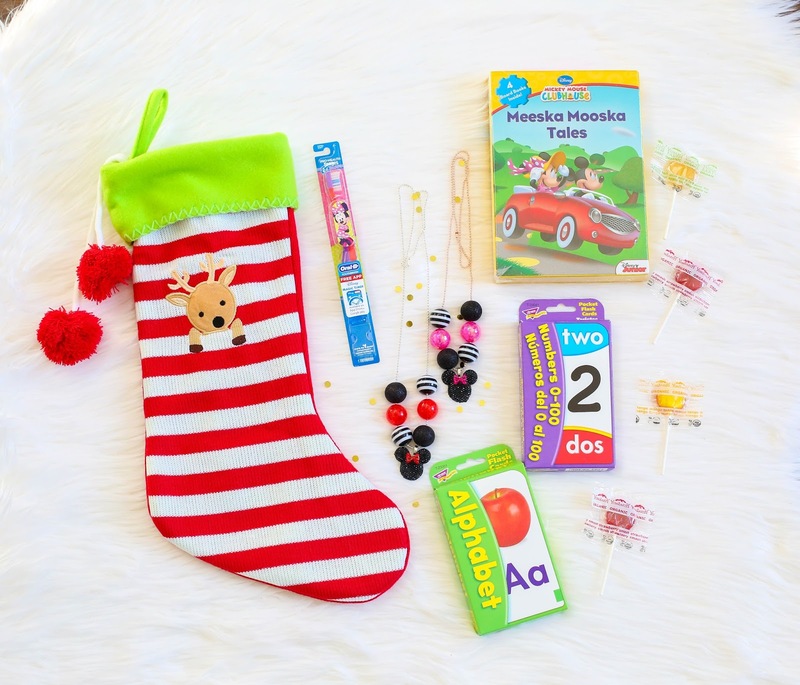 I was really excited to fill his first stocking with goodies that work out perfectly for him. Nuby Natural Touch Bottles. So far I’ve only introduced a bottle to Gio once. He took it like a champ but it seemed as if he had trouble taking in as much milk as he did. After searching high and low for the perfect bottle I finally settled on these Nuby Natural Touch bottles which are designed to mimic the feel, shape and function as a mothers breast. I’m really excited to give these a try and you can bet that I will be doing a follow up post on how Gio does with these! Nuby Teething Bib. Gio is a drool monster these days and also chewing on his tiny hands 24/7 lately so this teething big is so perfect! Its a 2 in 1 deal and available for purchase now at your local Walmart. Noxx Beanies. If you follow me on Instagram than you know I am obsessed with Noxx beanies. Not only are they well made but they have the BEST selection AND are so adorably cute my little guy! I love them all so much that I can never pick a favorite. These are definitely a must have for everyone! Here Comes Christmas. We are big time book worms around here so I was determined to get a book in everyone’s stockings this year. We have many books from Caroline Jayne Church that Isabella loved (and still does) so I thought this was a great choice for Gio and I can’t wait to read it to the kids! Isabella has become quite the Mickey Mouse Clubhouse fan. The first request she has every morning is to watch “tah tah” (Isabella-nese for Mickey Mouse) so I collected a few Mickey Mouse items that I know she will love! Minnie Mouse Necklaces. Another daily request I get from Isabella is to wear one of her Savannah Glam Designs necklaces. She is a total girly girl and loves dressing up. We have a DisneyLand trip planned for this coming March and I suspect she will be wearing one (or both) of these necklaces during our trip. Meeska Mooska Tales. This book set includes three books. Most nights before bed we read Isabella a book or two and I have a feeling these books will be our new reading material for the next few weeks after Christmas! Flash Cards. I bought these from Target (in store) but was unable to find the links for you online. Isabella is working hard on learning her ABC’s so I thought this would be a fun thing to do with her each day. I used flash cards with Anthony and found that they are great learning tools! YumEarth Organic Lollipops. Just for fun! I bought a huge tub of these for the kids and they love them. I thought she might enjoy seeing these in her stocking. If you look at this you probably think I’m telling my son he is smelly. I promise that was not my intent! Haha! He’s just at that age where he wants to smell as good as he looks! These are all things I know he loves (or will love). Chrome Cologne. Anthony is at the age now where he is putting a little extra effort into his morning routine and I think he will love the way this smells! Hersheys M&M’s. For his sweet tooth. Dove Men Care. Because it smells soooo good! Manual to Manhood. This book is just a little informational humor that I’m sure he will get a kick out of. It contains useful information all across the board including how to tie a tie, ask for a raise and cook the perfect steak. I flipped through it a bit before placing it in Anthony’s stocking and was surprised by how much it covers. « Its Beginning to Look a lot Like Christmas!